Manila (VNA) – Foreign Minister Pham Binh Minh had bilateral meetings with his counterparts from Singapore, Indonesia, the Philippines, Australia, and Laos in Manila, the Philippines, on August 5, on the sidelines of the 50th ASEAN Foreign Ministers’ Meeting (AMM 50) and related meetings. Meeting Singaporean FM Vivian Balakrishnan, both officials agreed on measures to accelerate the implementation of high-level commitments to achieve joint concrete benefits. Vivian Balakrishnan stated that Singapore will work with Vietnam for the successful APEC Year 2017, especially the APEC Economic Leaders’ Week in Da Nang in November. Meanwhile, Minh and Indonesia’s FM Retno Marsudi asserted the importance of maintaining contacts and high-ranking meetings, to bring bilateral ties to a new height. Minh suggested the two countries coordinate in protecting their fishermen, combating criminals at sea, while asking Indonesia to handle the issues of arrested fishing boats and fishermen humanely. At the meeting with the Philippine FM Alan Peter Cayetano, Minh affirmed that Vietnam supports and works with the Philippines in its ASEAN Chair in 2017 in speeding up the ASEAN Community building process, reinforcing the bloc’s solidarity, and safeguarding the grouping’s central role in tackling regional issues. He asked the Philippines to work to ensure safety for Vietnamese nationals being held by terrorists in the country as well as hasten the accomplishment of necessary procedures for the entry of Vietnamese vegetables, fruits, and poultry products there. Alan Peter Cayetano said he will soon work with relevant agencies in his country on the facilitation of Vietnamese farm products’ entry and pledged that he will make efforts to ensure safety for Vietnamese nationals being captured. At the meeting with Lao FM Saleumxay Kommasith, the officials vowed to work closely to deploy reached agreements, soundly organize celebrative activities, and accomplish the implementation of an agreement on settling undocumented migrants and marriages without licences in the two countries’ border areas. With Australian FM Julie Bishop, the officials agreed to step up cooperative efforts to fully tap the respective strengths and potential to develop bilateral ties to a new height. 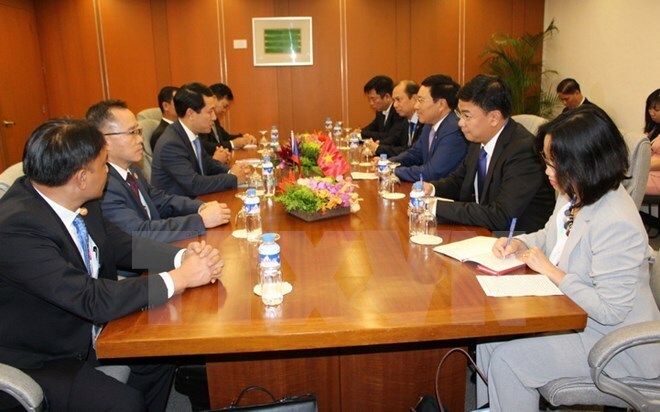 Minh asked Australia to continue facilitating the presence of Vietnamese farm and aquatic products and supporting the country in education and training. Minister Julie Bishop hailed Vietnam’s participation in the Colombo programme, which is tailored to enhance people-to-people exchanges, and education and training cooperation, including the reception of Australian students in Vietnam. Regarding regional and international issues, Minh and his counterparts agreed on pushing efforts to build the ASEAN Community, and increasing coordination to maintain ASEAN’s unity and central role in the region.